Roaming Stamper: Bronc Buster--Awesome Masculine Card! Here's another great card by my guest artist, Lisa. I don't know what to say about Lisa other than she always turns out the most awesome cards and projects. I love the VERY masculine look of this card. Lisa has done it once again! 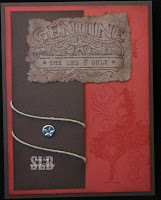 All produts from Stampin' Up! One thing I'd like to note on this card although the photo is good you don't get the true "feel" of this card. The Genuine "label" looks like the square on the back of an old pair of blue jeans. She took the Creamy Caramel cardstock and folded, crumpled, and refolded until it separated so it looks like worn leather. The edges are torn with some sponging around to give it an even more aged look. The Ruby Red has some sponging around the edges as well. It's a really awesome card! Thanks Lisa for being my guest artist! Love this card!! This set is on my very long wish list. I love the genuine label! I absolutely love this card. This is the best ever man card-my dad would love it. He's a true cowboy! Thank you Lisa!